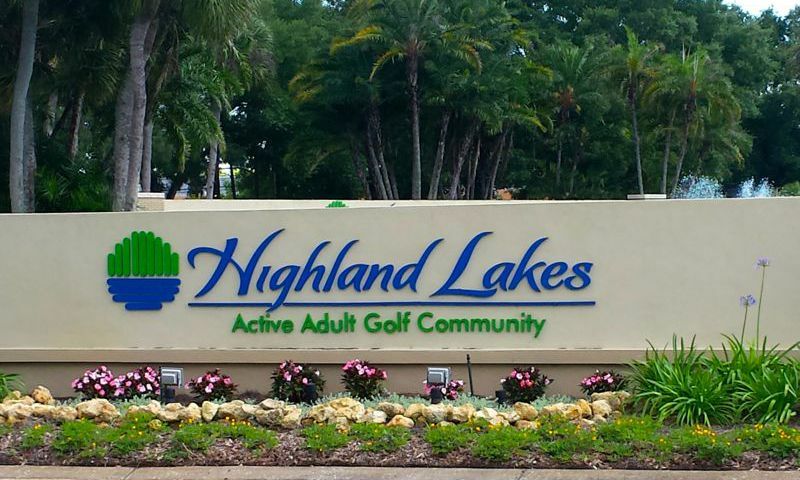 Highland Lakes is a 55+ community located in Palm Harbor, Florida. This active adult neighborhood boasts great country club-style amenities along with a low-maintenance lifestyle. Built between 1977 and 1989, Highland Lakes consists of 2,454 attached villas and single-family homes. Located just northwest of Tampa, Florida, the surrounding area offers great opportunities for recreation and entertainment. Highland Lakes offers its residents great amenities to stay socially and physically active. The main clubhouse includes a card room, billiards room, library, meeting room and a large ballroom where residents can enjoy dinners, dances, entertainment and fitness activities. Outside the clubhouse residents enjoy laying poolside or enjoy a dip in the hot summer heat. Those looking for a little friendly competition will enjoy the tennis, shuffleboard, and bocce ball courts. At the center of Highland Lakes is the 27-hole executive golf course. This course provides free play to all residents of all skill levels. Next to the clubhouse is the arts and crafts building. Here, residents can express their creative side inside of the ceramics room, woodworking shop, rooms for jewelry-making and stained-glass as well as art classes. They can also use the computer room to email loved ones. Another amenity center is Lake Tarpon Lodge. The lodge is mainly used for club meetings, fitness activities like yoga or Zumba, and other community gatherings. Outside the lodge residents will find an outdoor pool and patio with a picnic area and BBQ grills along with access to Lake Tarpon. It is also available for residents to rent out for personal use. The two Highland Lakes pontoon boats are docked at the Lodge and take residents and their guests on two trips daily around the lake with a stop at a local restaurant. Built between 1977 and 1989 Highland Lakes consists of 2,454 attached villas and single-family homes available on a resale-only basis. The attached villas offer one to two bedrooms with one-and-a-half to two bathrooms and an attached one to two-car garage. These homes are great for those looking to downsize without giving up functionality. Single-family homes in the community offer between one to three bedrooms, one-and-a-half to two-and-a-half bathrooms and an attached one to two-car garage. These homes offer great low-maintenance exteriors and great single-floor living great for active adults. Most homes offer screened-in patios and some even have private pools. Residents of Highland Lakes enjoy a great low-maintenance lifestyle. An annual homeowners' association (HOA) fee covers general maintenance of the community grounds as well as all community amenities. This great lifestyle allows residents to step back from those tedious tasks and enjoy friends and family as well as their hobbies. With so much extra free time, residents in Highland Lakes enjoy a long list of clubs and activities. Those looking to stay physically active will love the tennis club, or water aerobics. Others who are looking for more of a social connection will appreciate the book club, card clubs and billiards club. The numerous community parties and functions are also a big hit with residents. Located in Palm Harbor, Florida, Highland Lakes is surrounded by the beautiful scenery of the Central Gulf Coast area. Residents never have to travel too far for daily conveniences as there are great options for shopping, dining, and medical services just outside the community. Just a few miles from the Gulf of Mexico residents often plan day trips to any one of the white sand beaches up and down the coastline. The area of Palm Harbor offers a quiet oasis close to the urban city of Tampa. Sports fans will enjoy the professional sports teams such as the Tampa Bay Rays baseball team and the Tampa Bay Lighting football team. Countless opportunities for entertainment and recreation in such a scenic location draws active adults from across the country to Highland Lakes. Highland Lakes on Lake Tarpon is a superb 55+ community for active adults in Pinellas County, Florida. Residents of Highland Lakes can use the Arts & Crafts building at their leisure. The Lake Tarpon Lodge serves as a place for community parties and meetings. Residents can also rent out the Lake Tarpon Lodge for private functions. There are plenty of activities available in Highland Lakes on Lake Tarpon. Here is a sample of some of the clubs, activities and classes offered here. The attached villas offer one to two bedrooms with one-and-a-half to two bathrooms and an attached one to two-car garage. These homes are great for those looking to downsize without giving up functionality. Please Note: Floor plans are not available at this time. Single-family homes in the community offer between one to three bedrooms, one-and-a-half to two-and-a-half bathrooms and an attached one to two-car garage. These homes offer low-maintenance exteriors and single-floor living great for active adults. Most homes offer screened-in patios and some even have private pools. Please Note: Floor plans are not available at this time. still have not had time to enjoy all the fun things to do. I love our community. It is easy to meet people and find friends that enjoy the same things you do. We love our home and our street. We look forward to many more years, new friends and new hobbies. Retirement is fun at Highland Lakes. 55places.com is not affiliated with the developer(s) or homeowners association of Highland Lakes on Lake Tarpon. The information you submit is distributed to a 55places.com Partner Agent, who is a licensed real estate agent. The information regarding Highland Lakes on Lake Tarpon has not been verified or approved by the developer or homeowners association. Please verify all information prior to purchasing. 55places.com is not responsible for any errors regarding the information displayed on this website.